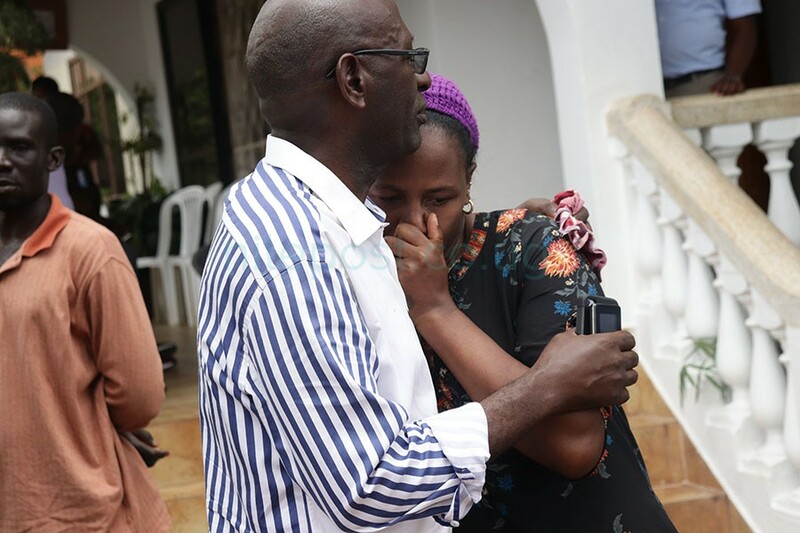 Friends and relatives have gathered at the home of businessman and former rally driver Charles Muhangi in Munyega to commiserate with the family. Speaking to Nile Post, a number of his friends with whom he spent the day on Wednesday said he was in good health and that they were shocked to hear of his death. 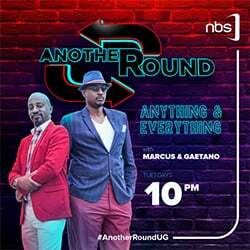 “I was with him from 8pm up to mid night at Café Javas along Bombo road. He took chocolate and juice and some of it was packed for him to take home,” said Charles Karangwa, a friend to the deceased. Karangwa said by mid night when they left the restaurant along Bombo road, the businessman was in good shape and that they had arranged to meet today (Thursday). John Tabuley, who described himself as a close friend to Muhangi for over 19 years said he had been asked by the deceased to go to the land office to crosscheck with some documents and that at around 10pm, he called him to get feedback. Relatives console each other following Muhangi’s death. Photo by Kenneth Kazibwe. “After getting feeding back from me, he asked me to meet him today at 11am at his office along Namirembe road. He didn’t complain of any illness. When I was proceeding to meet him today, I was called that he had died. It was a shock to me,”Tabuley said. 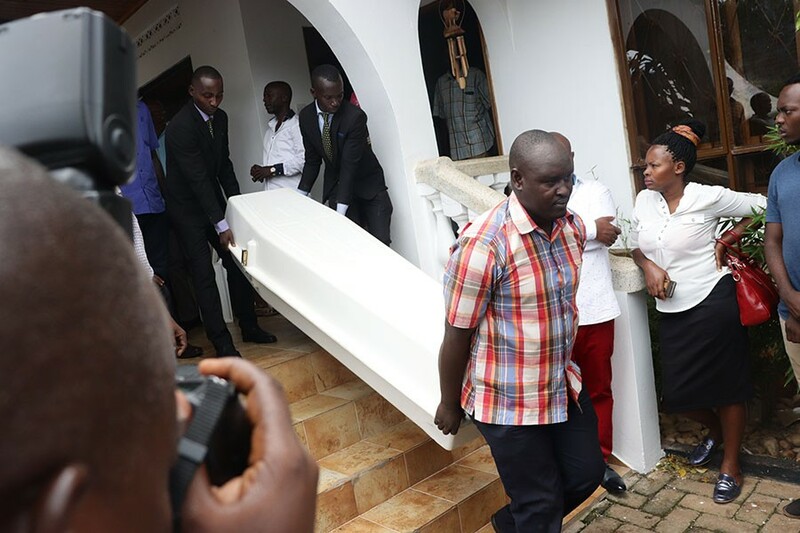 Most of Muhangi’s friends who this website talked to confirmed that the 65-year-old businessman was in good health on Wednesday, only hours before he could be pronounced dead. 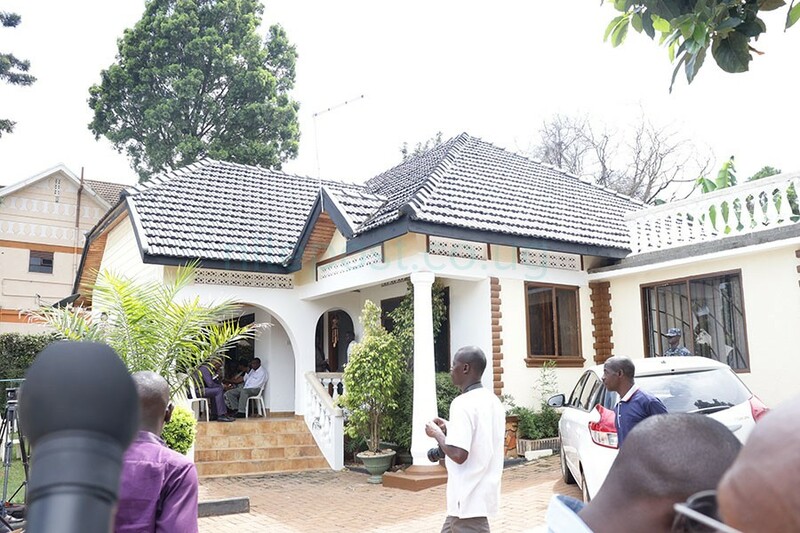 Relatives gather at Muhangi’s home in Kampala. According to a family member who preferred anonymity, as his routine was, Muhangi returned home late and went straight to bed. “Usually, when he returns, he just sleeps and wakes up late. The wife always wakes up early to prepare the children for school as he slept as was the case today,” said a family member who preferred anonymity. However many of the family members and friends suspect some foul play in Muhangi’s death. 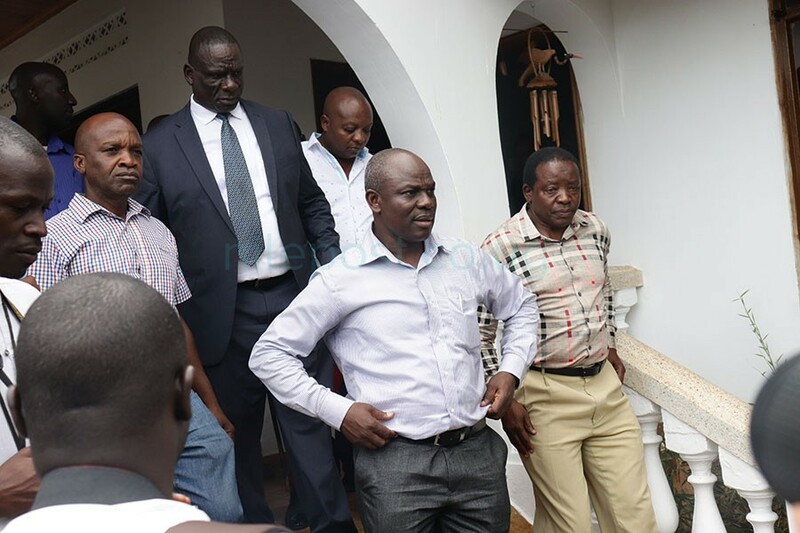 Friends of Muhangi’s look on in disbelief. Photo by Kenneth Kazibwe. Whereas others were claiming that the businessman had been poisoned, other reports indicated that he was diabetic and that could have caused his death. Muhangi’s body was later taken to Mulago for a postmortem. Police spokesperson Emilian Kayima confirmed the body had been taken to allow pathologists examine it before being released to be buried. Muhangi has been involved in a wrangle over commercial buildings in Kampala with fellow businessmen, Mansur Matovu and Drake Lubega. The three businessmen claimed ownership of a plot of land on which Qualicel bus terminal, Qualicel building and Nabukeera Plaza stand. President Museveni recently met the three businessmen in a bid to resolve the impasse over the piece of land.